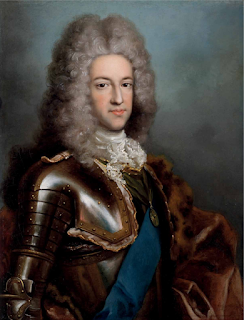 On 4th February 1716 James Francis Edward Stuart abandoned his attempt to seize the crowns of England, Scotland and Ireland from the Hanoverian King George I. He is less well-known than his son (“Bonnie Prince Charlie”) although history knows them as the Old Pretender and Young Pretender, respectively. The 1716 event was the second abortive mission by James Francis Edward Stuart to restore the Stuart line, but it would be another thirty years or so before his son, Charles Edward Stuart, would try again (and also fail) on his behalf. “Bonnie Prince Charlie” is better known than his father, partly because he posed a much greater threat to the Hanoverian establishment but also because of the stories that have grown up around the “Young Chevalier” and songs such as the “Skye Boat Song” that tell of his adventures. By contrast, the story of the Old Pretender is not often told. One very good reason for this is that there is not much to tell! James Edward Stuart was only six months old when his father, King James II, was forced into exile in France during the “Glorious Revolution” of 1688. The throne was offered by Parliament to James’s daughter Mary and her husband William of Orange, although the rules of succession should have preferred James Edward, as he was his father’s only male heir. However, the big difference was that Mary and her sister Anne (who would later rule as Queen Anne) were the daughters of James II’s Protestant wife Anne Hyde, but James Edward’s mother was Mary of Modena, a staunch Catholic who became King James’s second wife after the death of Anne Hyde. It was James Edward’s Catholic religion that barred him from the throne, even after the deaths of both his half-sisters, neither of whom produced heirs. James Edward’s first attempt to invade Britain was in 1708 when he sailed from France to the Firth of Forth, but he never even made it to shore because his flotilla was intercepted by a British fleet and the French admiral, much to James’s disgust, preferred to head back to France rather than risk a naval battle. James did slightly better the second time around, in that he did at least manage to set foot in Scotland. He landed at Peterhead (near Aberdeen) on 22nd December 1715 in the hope of rallying the whole of Scotland to his cause and leading a mighty army to sweep south and send King George fleeing back to Hanover much as his own father had been forced into exile 27 years previously. However, he must have been sadly disappointed when it became clear to him that the expected support simply was not there. The Scots were more interested in getting on with their lives and settling their own more local disputes than risking all by joining a rebellion. James Edward, despite being a perfectly respectable man, was no rabble-rouser or leader of men and had no military experience worth speaking of. The revolution was stymied before it even began. After 44 days of getting nowhere, James Edward got back on board his ship and headed back to France. The rest of his life was a somewhat sad one, lived entirely in exile (mostly in Rome after the French royals got tired of having him around) but also in a fantasy world in which he was a king who deserved all the respect due to one of royal birth. He died on 1st January 1766 at the age of 77, having “reigned” for more than 64 years.